Successfully Added Rearview LCD Monitor - 7 Inch Multimedia Player to your Shopping Cart. 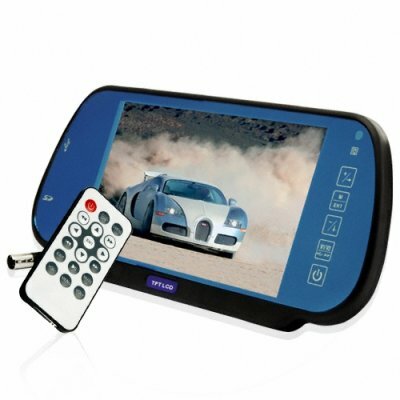 Rearview car video monitor / media center with a 7 inch (17.75cm) TFT LCD screen. This compact LCD video monitor attaches over an existing rear view mirror and is used to enhance your daily commuting experience. The CVSBD-6700 utilizes input from both direct video-in and popular audio/video digital files from both SD media cards and USB drives. In particular, the video-in allows a convenient rear view camera feed directly to the driver while the SD and USB input slots allow you to bring your digital media with you on the road. With its built in FM Transmitter, audio output is sent directly to your cars own superior sound system, making your MP3's and other digital media come alive. Often use your rearview mirror? No worries, the CVSBD-6700 has a polarized screen so it works as a large rearview mirror when the color screen is not active. A great wholesale price makes this Rearview LCD Monitor perfect either for the resale market, OEM market, or personal/company use. As always, it is only available from your source for wholesale direct from China electronic products, Chinavasion. Rearview Mirror Pinch Clip: Adjustable from 60mm-90mm (height). Mirror should be at least be at least 150mm long.